Field effect transistors are used in many different areas of electronic circuits. These are able to provide characteristics that are not possible when using the more traditional bipolar transistors. FET circuit design techniques are often used in overall circuit design. These are available in a number of different types. There are several different types of Field effect transistor circuits that can be used both as discrete circuits and within integrated circuits also. 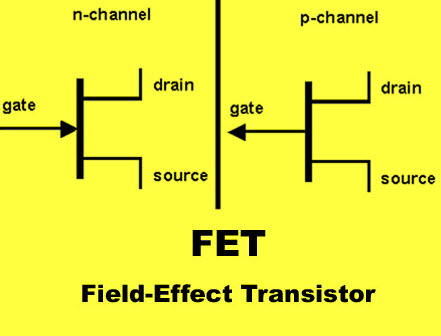 Before considering the use of a FET circuits let’s consider FET technology and the type of field effect transistor. Which will be the most applicable. Different types of FETs are available to design different circuits. They are Junction field effect transistors (JFET), Metal Oxide Silicon FET (MOSFET), VFET and more. These all are based on the same basic technology. In all these FETs electric field alters the flow of current through a semiconductor channel. The basic FET symbol is shown below. The Field Effect Transistor consists of three terminals such as source, drain and gate. The Source (S) is the electrode of the transistor, which the charge carriers enter the channel, then it acts as the source of carriers for the device, current flowing through the source to the channel is chosen by IS. There are various types of FETs which are used in the circuit design. Here different types of FETs with characteristics are discussed below. The J-FET is a one type of transistor where the gate terminal is formed by using a junction diode onto the channel. Junction FETs are used in amplifiers, switches or voltage controlled resistors. These transistors consist of p-type channel or n-type channel. In the p-type channel, when the voltage is applied to the gate terminal that is less than the voltage applied to the source terminal. Likewise, in the p-type, when the voltage is applied to the gate terminal that is greater than the voltage applied to the source terminal. The MOSFET is one type of field effect transistor that depends on a metal oxide later between the gate and channel, and it offers a high input resistance. As the name suggests, this type of MOSFET consists of two gates, these types of MOSFETs are used in FET circuit design to give additional options. These types of FETs are OFF at zero gate-source voltage. They are turned ON by pulling the gate voltage towards the supply rail, which is positive for N-channel and negative for P-channel. In a depletion-mode MOSFET, the FET is normally ON at zero gate source voltage. The voltage of any gate in the direction of the drain will tend to reduce the active area of channel of carriers and decrease the flow of current. A N-channel FET has a channel which is made from N-type semiconductor. In this channel, electrons are the majority charge carriers. A P-channel FET has a channel which is made from P-type semiconductor. The majority charge carriers are holes in this channel. When designing a circuit using FET, one of the first step is the selection of the FET (basic type, channel type or mode type), that is based on the application required. FET circuits operate slightly different by giving different levels of gain and impedance. The terminology used for indicating the three basic FET configurations specifies the FET electrode that is common to both i/p & o/p circuits. The three transistor configurations are: common gate, common drain & common source. Common Gate: This configuration provides a low input impedance while offering a high output impedance. Although, When the voltage is high, the current gain is low and the gain of the total power is also low when compared to the other FET circuits. The other feature of this common gate configuration is that the i/p & and o/p signals are in phase. Common Drain: This configuration is also known as the source follower. Because, the source voltage follows the gate. Offering a high i/p impedance & a low o/p impedance are widely used as a buffer. The voltage gain is unity, while the current gain is high. The other feature of this configuration is that the input and output signals are in phase. Common Source: Probably, this is the most widely used configuration. It provides a medium i/p and o/p impedance levels. The gain of the both voltage and current can be described as medium, but the output is the opposite to the input, i.e. 180° phase change, and it provides a good overall performance. The below table gives major properties of the different FET circuit configurations. 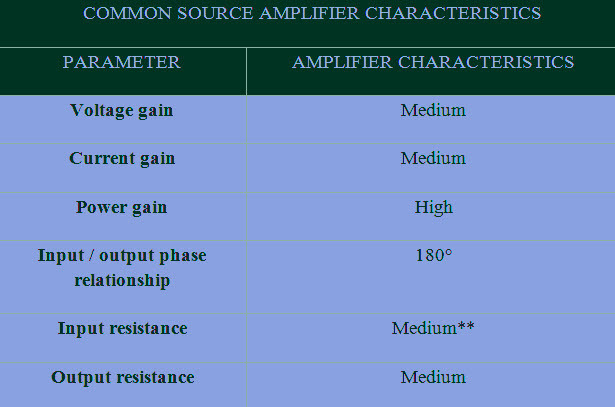 The below table gives the major characteristics of the common source FET. 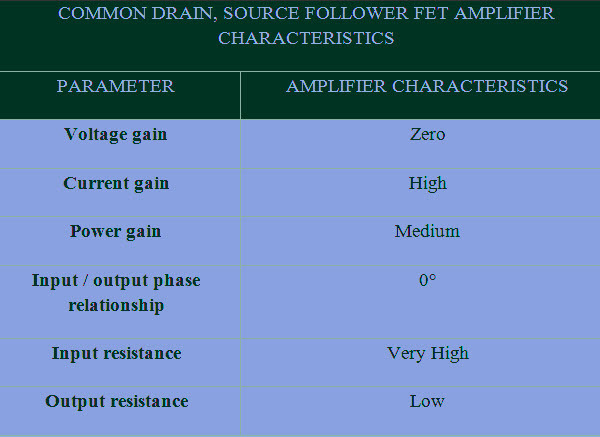 The below table gives the major characteristics of the Drain FET. 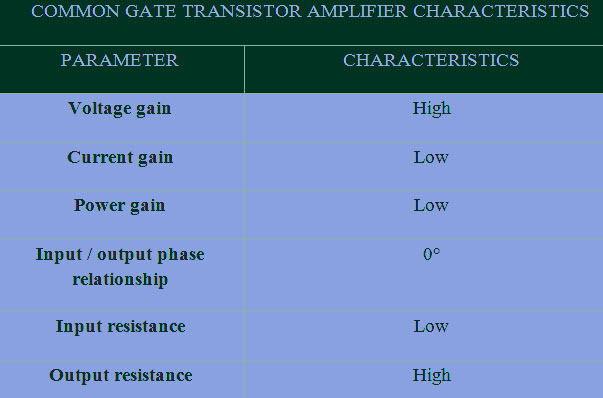 The below table gives the major characteristics of the common gate FET. This is all about field effect transistor circuit with characteristics. Furthermore, any queries regarding this concept or if you want to know practically how to build your own project using Et, then you can download our free book to design your projects. Here is a question for you, How many diodes JFET contains? Wonderful website. Plenty of helpful information here. I am sending it to some friends ans also sharing in delicious. And naturally, thank you on your effort! Hi there, I would like to subscribe for this website to take latest updates, therefore where can i do it please assist. that hee must be visit this web page and be up to date everyday.